An accurate positioning of every train is key to our train collision avoidance system, and one (though not the only one) sensor contributing to this is a Global Navigation Satellite System (GNSS) receiver in our onboard units. Some readers might be aware of the so called “week rollover problem” of the most prominent GNSS, which is the American GPS. Some receivers, even some known to be high end ones, are affected by this problem or imperfections in their common workarounds. 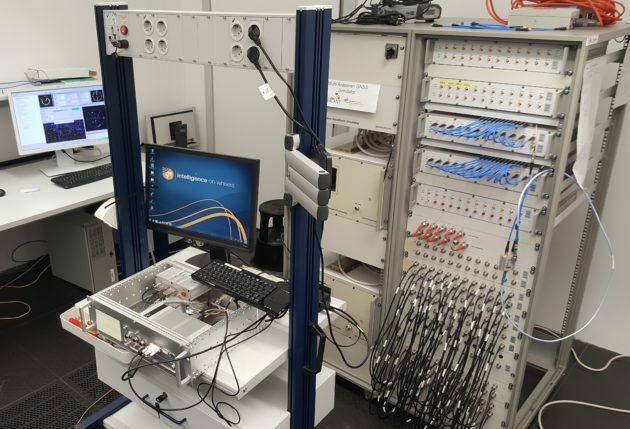 Given our heritage of being a spin-off of the German Aerospace Center (DLR), we were able to again make use of our common special expertise and DLR’s unique tools such as two GNSS Multi-Constallation-Simulators to validate that IoW’s products are not affected by the rollover problem. With these tools several artificial satellite constellations have been created on signal level and exposed to our receivers. These signals are so exact that the receivers could not distinguish them from real signals coming from satellites. This way our onboard units and the like were receiving signals of the future, just a few years early. The picture below gives an impression of these validation tests.